Why Do You Need Sunscreen In Winter? Nowadays, we hear more and more how essential to our skin´s health and anti-aging protection is to daily wear sunscreen even in the Winter. But what are the reasons for this need and what are the benefits of protecting our skin from the Sun during the whole year? Together with some other basic skin care routine steps, it has been said that wearing a sunscreen daily even at an early age is one of the best things you can do to prevent premature skin aging. The scientists warn us that that the cumulative effect the UV radiation has on our skin over the years becomes visible at some point and then it is very difficult to reverse this damage. Unfortunately, a lot of people including men and women wear sunscreen only during the summer because they think that the UV radiation is not equally strong during the winter and therefore there is less possibility for sun damaged skin. The truth is that the UV radiation is the same and equally dangerous during all seasons, the only thing that changes is the heat of the sun. 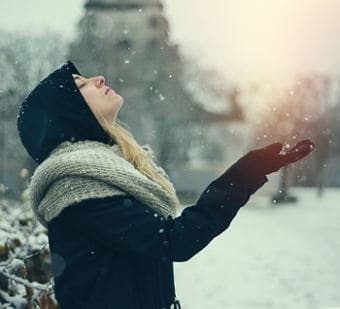 Now let´s see in detail what happens with UV radiation during the winter and how our skin is affected by answering some common questions that people have about sun radiation during winter. Is UV Radiation Less During Winter? As we have already mentioned, UV rays are always active even during those days that it´s cloudy, rainy or even snowy. It is said that even up to 80% of the UV radiation can penetrate the clouds. What really happens is that UVB rays weaken while the UVA rays that are mostly responsible for skin aging deeply penetrate the skin and seriously damage the skin cells. UVA rays are equally strong and dangerous for the skin throughout the year. They can penetrate the glasses of the office, house and car, and are the main cause for sun damage accumulation. When looking for an effective sunscreen, it is always better to buy one that has protection both against UVA and UVB sun rays. What Happens to the Hydrolipid Film of Our Skin during Winter? When the temperatures are low, it is a fact that our skin suffers. Intense dryness, itchiness, scaly bleeding skin, redness and irritation are some of the negative effects of cold temperatures to our skin. Exposure to those cold temperatures and the rapid change of those temperatures from very cold to very warm ones disturb the balance of our skin´s hydrolipid film and has some negative effects such as the reduction of the lipids production, which leads to the skin getting dehydrated very easily. This in turn makes it vulnerable to external attacks such as allergens or bacteria. Do sunscreens protect photosensitive skin? When trying to undo some of the sun damage our skin has been afflicted with in the form of skin discoloration and sun spots or dark spots, a lot of people use retinol, aha acids and other whitening agents. The exfoliating and cell renewal effects that these ingredients offer can also cause photosensitivity if you expose your skin to the sun soon after following treatments containing these components. In this case, a good sunscreen is more than necessary to protect your skin from photosensitivity. In conclusion, if you want to protect your skin from sun damage and aging all year round, the use of an effective sunscreen is absolutely necessary.